I love Dewey’s Pizza. The restaurant opened in Grandview, Ohio, around this time last year. I frequent it about two or three times a month. It’s a lot, I know. But once you try their Ryan’s Inferno pizza with the chicken, ranch and buffalo sauce, then you can let me know how often you frequent it and it might be similar. Dewey’s changes their beer selection every season. I usually go there and sit at the bar, get a beer and wait for my Ryan’s Inferno pizza. As I’m drinking the cool, refreshing beverage that may or may not get me a little buzzed by the time the pizza comes, I have time to decide if the beer is good enough to get a second one. The fact that I was slightly wrong about it being related to Godzilla was a little bit disappointing at first when I looked it up. It did make up for it when I found out why they really named it that way. 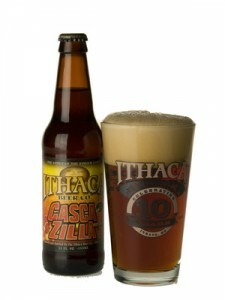 The Ithaca Beer Company named it CascaZilla to represent the Cascadilla Gorge in New York and the “monster” amount of hops in the beer. The beer was so good that it was even better when I was eating it with my pizza. I decided to go back to Dewey’s four days later to get another Ryan’s Inferno pizza and a CascaZilla beer. It was just as satisfying and delicious as it was the first time.